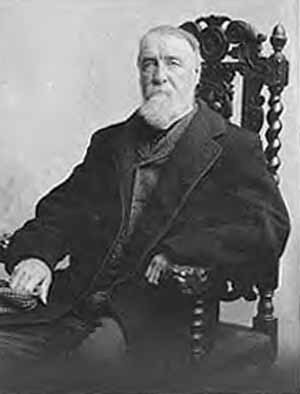 Today I found out the baseball box score was first developed and introduced by Henry Chadwick, “The Father of Baseball”. Chadwick also authored Baseball’s first rule book; devised the batting average and earned run average; compiled the game’s first instructional guides and player and statistical reference books, among a variety of other contributions to the game. He is also the only writer to have been elected into the Baseball Hall of Fame in the non-writers wing. Henry Chadwick was born on October the 5th, 1824 in Exeter, England. As a boy, he was a huge fan of cricket and an avid player of “rounders”, which was the precursor to baseball. In 1837, he and his family immigrated to the United States to Brooklyn, New York. Chadwick initially didn’t like the game of baseball, preferring cricket, though he played baseball with his friends. However, in 1856, after attending a particularly well played game between two of New York’s best teams, he became a fan and eventually a fanatic of the game. From there he set out to make baseball “a national sport for Americans” as cricket was for the English. The first thing he did was try to persuade the New York Times, who prominently reported cricket matches, to start covering baseball as well. He even offered to report the games himself, so they wouldn’t have to hire anyone for the job. Eventually, he got a job at the New York Clipper as a sportswriter in 1857. From there, he set about trying to develop a system that would succinctly whittle down the important events of the game for scoring purposes and for the ability to evaluate a particular player’s contribution to a team and individual games. In 1859, covering a match between the Brooklyn Excelsior and the Brooklyn Stars, Chadwick recorded the runs, hits, putouts, singles, and errors being the first instance of what we now know of as the box score. Before this, others had tried to grapple with coming up with a way to systematically record the important events of the game, but none before this had been successfully. He later refined this box score into pretty much what we typically use today, with a few tweaks that we have now, such as adding RBIs and things of this nature. It’s interesting to note that walks were not ever included in Chadwick’s box scores. This is because Chadwick felt that walks didn’t belong in the game, nor out of the park home runs. He felt that the beauty of the game was in the action of the players. Walks and out of the park home runs were a non-action, involving only the pitcher and hitter with everybody else just kind of standing around. This fateful decision to discount walks is why the batting average has long been thought of as more important than on base percentage, even though statistically a walk is virtually as valuable as a single which obviously counts on the batting average (note: not quite as valuable, but the difference is extremely small). With work done by people like Bill James and the myriad of other sabermetrics contributors and enthusiasts, this is starting to change however and a more accurate view of what is and what isn’t valuable on the field is beginning to emerge. With less and less resistance to these new analysis on the game happening every year; though ironically the players themselves look like they are going to be the last hold outs; still clinging to antiquated methods of evaluating the game. Ironical because, in effect, many don’t really have a great understand of what specific aspects of their game make them great or maximize their contributions to the team. Though this too is ever so slowly starting to change with players like Brian Bannister and Zack Grienke, who are beginning to use these advanced statistics to get everything they can out of their talent. It’s also interesting to note that Chadwick didn’t think the “error” was a very good evaluator of defensive ability and is on record as saying range was much more important than errors. This flies in the face of traditional baseball analysts who often cite Chadwick’s box score insinuating that a baseball genius like Chadwick would have put something in about range if it was more important than errors. In reality, Chadwick did not put this in as there was no way at the time to accurately judge how a player’s range affected a specific game/play vs. some other player. Indeed, up until about 10 years ago or so, there wasn’t an accurate way to evaluate this. Only with very recent technological advancements has this become possible. It should be noted though, that before the 1960s, the box score contained a lot more defensive data, such as assists and things of this nature that could be accurately recorded. The box score was shortened though at this time in the interest of space, now only including errors, if any. Chadwick eventually died of pneumonia after attending the Giants’ opening game at the Polo Grounds in 1908, subsequently getting sick. Upon his death, every major league park lowered their flags to half-mast. 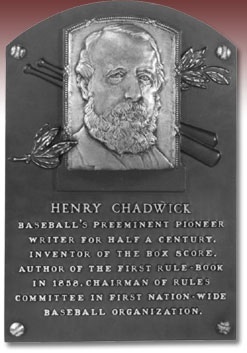 Chadwick was later elected into the newly established Baseball Hall of Fame in 1938; the only writer to have gained that honor. 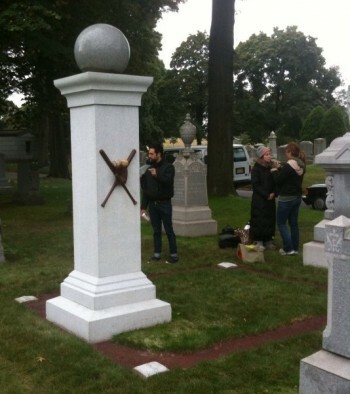 Chadwick is buried with his wife in Green-Wood Cemetery in Brooklyn, New York. The tall marble pillar over their shared grave is topped with an enormous granite baseball and the grave itself is adorned with a bronze glove and bats. His grave is marked with, among other things, “The Father of Baseball”. A Base Ball tourney had been held in Chicago on July 4, 1867, in which the Excelsiors of that city and the Forest City Club, of Rockford, had been the leading contestants. The former had defeated the Forest City nine in two games, by the very close scores of 45-41 in one, and 28-25 in another, when the Forest Citys were invited to meet the Nationals at Chicago on July 25th, a day which proved the most notable of the tour. The contest took place at Dexter Park, before a vast crowd of spectators, the majority of whom looked to see the Nationals have almost a walk-over. In the game A. G. Spalding was pitcher and Ross Barnes shortstop for the Forest City nine; these two afterwards becoming famous as star players of the Boston professional team of the early seventies. Williams was pitcher for the Nationals and Frank Norton catcher. The Nationals took the lead in the first innings by 3 to 2; but in the next two innings they added but five runs to their score, while the Forest Citys added thirteen to theirs, thereby taking the lead by a score of fifteen to eight, to the great surprise of the crowd and the delight of the Rockfords. The Nationals tried hard to recover the lost ground. The final result, however, was the success of the Forest Citys by a score of 29 to 23 in a nine innings game, twice interrupted by rain. Chadwick’s commentary on the game was so revered that when he attended games, it was not out of the ordinary for umpires to stop play to confer with him about some rule interpretation that pertained to the play at hand. Chadwick was the first to setup a demonstration proving that the rotation of a baseball could cause the ball to curve. Before this, some pitchers had already observed and use this to their advantage (even though many of the day considered it cheating), but no one had yet proved that it was an actual effect and not just in the pitchers heads. To prove it, he set up two stakes placed twenty feet apart in a line between the pitcher and batter’s box. A pitcher, Fred Goldsmith, then threw a ball which ended up being to the right of the first stake, but then curved to end up to the left of the second stake. Henry Chadwick’s half-brother, Sir Edwin Chadwick, was knighted for his service as Sanitary Commissioner of London, where he promoted the idea that cholera and other disease were spread by stench, not by germs, and thus he advocated frequent bathing with soap and water as a means of disease control. While not entirely correct in his thinking, this none the less was an effective way of cutting down on the many widespread diseases and sicknesses at the time. The 1861 Beadle guide, created by Chadwick, listed totals of games played, outs, runs, home runs, and strikeouts for hitters on prominent clubs. This was the first baseball statistical database. His goal in creating this database was to figure out a way to prove whether a particular player helped or hurt a team using statistical analysis. This makes it particularly ironical that so many baseball traditionalists use his work as their excuse for not embracing sabermetrics. Chadwick was the first sabermatrician and likely would have loved the new metrics that are being developed today using technologies he did not have available. When Chadwick developed the ERA (earned run average) statistic, his goal was not to evaluate a pitchers worth, but rather to differentiate between runs caused by batting skill and those caused by lack of fielding skill; the pitcher’s skill was not factored in. This makes sense considering pitchers of the day tended to just throw the ball right down the middle of the plate with any fanciness like curve-balls or any other deception by the pitcher often being considered by many to be cheating. This is one of the reasons why baseball scores of the day often had teams scoring 30 or 40 runs per game. The first baseball box scores were closely related to cricket. This is why the first box scores listed so prominently O as the number of put outs and R as the number of runs scored by a player. During his long career as a writer, Chadwick penned all his newspaper columns and books by hand, rather than use a typewriter. When not promoting baseball or covering games, Chadwick worked as a piano teacher and occasionally reviewed dramas. Why is the “K” used for the strikeout in baseball? Today I found out that the “Father of Baseball” shares the same birthday as myself!